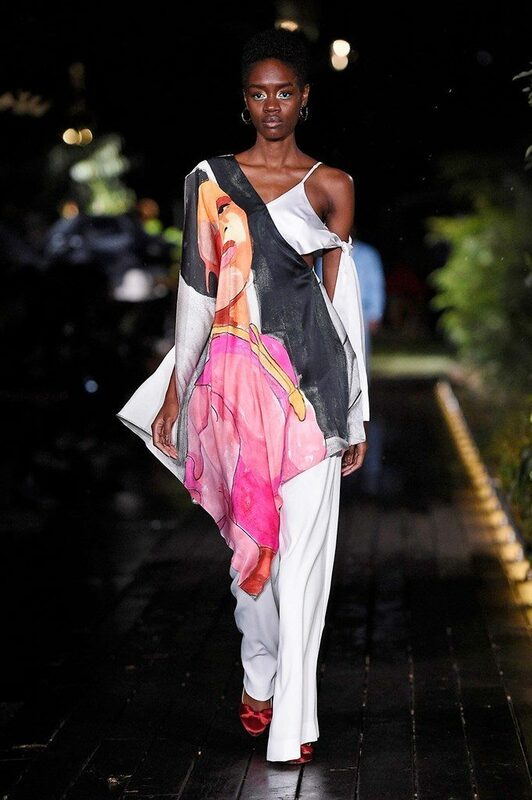 Pyer Moss has revealed its Spring/Summer 2019 collection with beautiful, bright, and politically charged fashion once again. The designer, Kerby Jean-Raymond, is no stranger to political and cultural commentary. In his FW15 collection during NYFW, the designer had screened a 15-minute video about police brutality in the black community. As a result, he received death threats from the KKK. 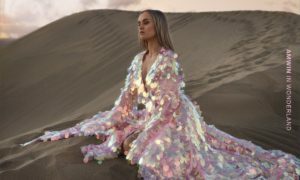 Despite the negative commentary from fashion journalists about the overuse of politics on the runway and the threats he has received as a result of his activism, Jean-Raymond continued to use fashion to bring awareness to the problems minorities face in America. In his FW17 collection, he drew inspiration from the struggles he sees not only in the media, but at home growing up with immigrant parents. 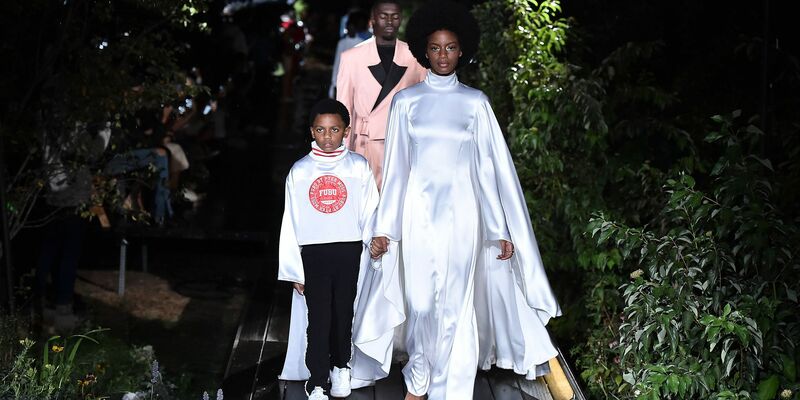 While his FW17 collection was focused largely on his perspective on the struggles that his Haitian father experienced raising a child on his own, Jean-Raymond commented that for the SS19 collection, he had a clear idea of how he wanted African American culture to be depicted on his runway. The show was held in Weeksville, one of the country’s first black communities founded by James Week in 1838. Jean-Raymond, who was raised in Weeksville, found that the Weeksville Heritage Center was the perfect backdrop for his vision since the institution happens to be dedicated to preserving the community’s African American culture. The show brought back the 90s streetwear brand FUBU in order to reintroduce a highly successful brand whose urban identity got lost in the shuffle when compared to brands that were considered high fashion. One piece that stood out from the collaboration was a mustard yellow leather vest with the FUBU logo written across it in white. The look was finished with white flowy pants and red close heeled satin shoes. 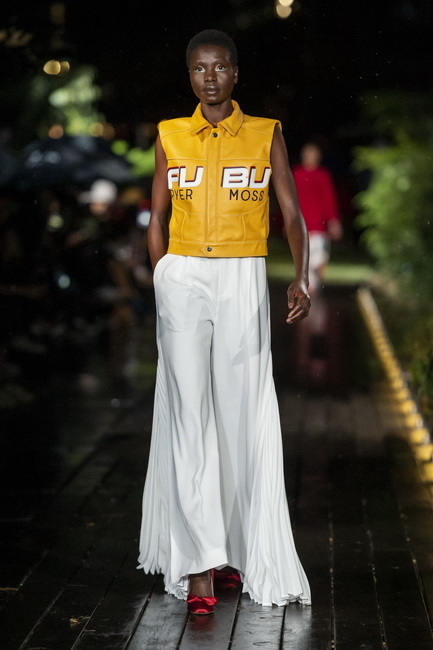 Model wearing a FUBU X Pyer Moss. Jean-Raymond also worked with the famous black artist, Derrick Adams to create 10 new portraits displaying black families partaking in everyday activities. 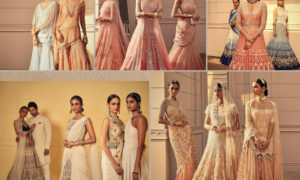 These paintings were showcased on several of the pieces, including hand painted tunics and a Swarovski-embellished gown. True to Kerby Jean-Raymond’s nature, the show had memorable moments of activism displayed. One t-shirt read “STOP CALLING 911 ON THE CULTURE” and another read “SEE US NOW”. These powerful statements are a call out to not only the fashion industry but the whole world. In a country where a black man will have the police called on him for lounging by the community pool at his own apartment, and where a black man will get shot at more than ten times in his family’s home because his phone apparently looks like a gun, the media is quick to ignore the struggles of African Americans, but are eager to use our dialect as slang, praise our music, wear our culture as a costume, and then turn around and shame us for the very culture they deem high fashion or edgy. We are seen at our greatest and most memorable moments, but are ignored as we continue to struggle against racial issues and police brutality. 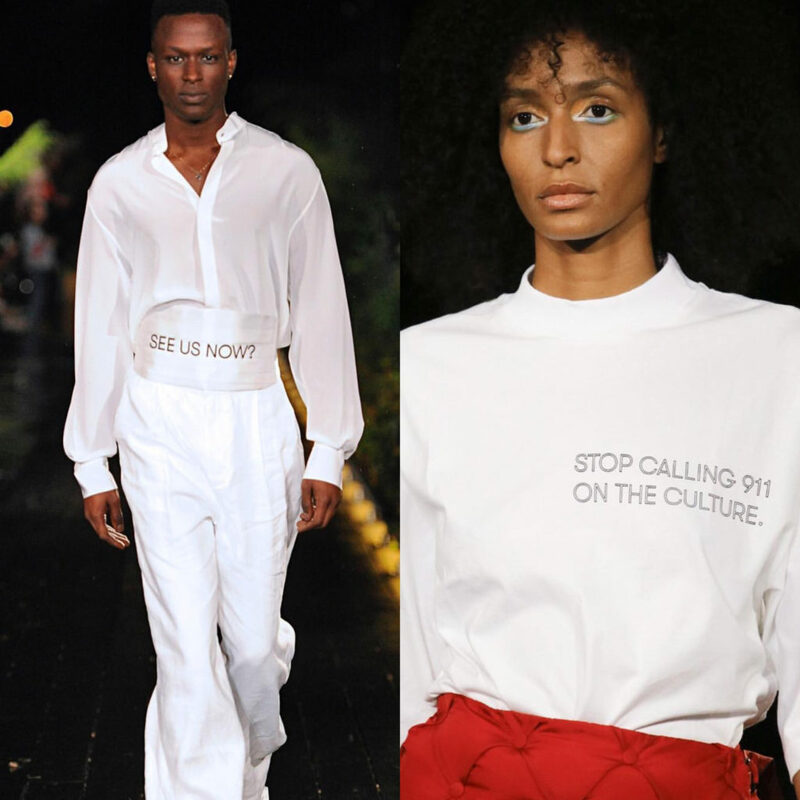 The looks on the runway successfully merged the celebration of African American culture and family while also pointing out the hypocrisy of media and the usage of the police in situations they are not needed. Despite Pyer Moss being a hit or miss among fashion journalists for his work, it’s important to appreciate Kerby Jean-Raymond for not being afraid to merge politics and fashion and for especially being a man who uses his huge platform to continuously speak about the trials minorities face in America, while also appreciating the culture he comes from.